2012 US Open Golf: Will Tiger Woods Return to the Top? Fresh off his June 3rd victory at the Memorial Tournament, Tiger Woods will look to win his 4th US Open and 15th Major overall at the Olympic Golf Club in San Francisco, CA on June 14-17. Also in the 156-player field will be World No. 1 Luke Donald, 2012 Masters winner Bubba Watson, last year’s Open champ Rory McIlroy, and the youngest player ever to compete in a US Open, 14 year-old Andy Zhang. The Open is returning to Olympic Golf Club for the first time since 1998. Tickets for the event are going fast, thanks in large part to the star-studded early round grouping of Woods, Watson, and Phil Mickelson. On the tournament’s official website, the only remaining available Grounds Tickets are for Thursday’s opening round and are priced at $110. However, Thursday tickets are averaging only $70.55 on the secondary market (a 36% discount). Friday tickets on the resell market are going for an average of $114.76. Also available are more upscale passes which allow access to Hospitality Tents or the 1895 or Trophy Clubs. These are averaging $397.18 on the secondary market. 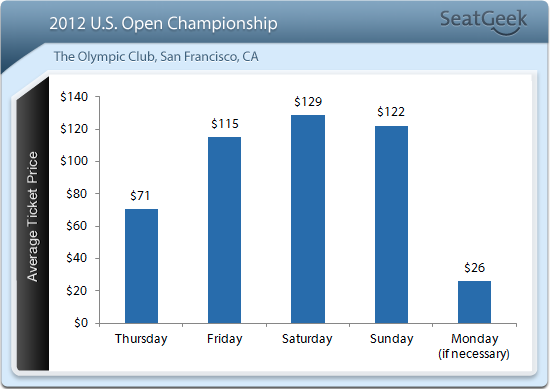 2012 US Open Golf Championship Tickets are going for about the same amount as the upcoming PGA Championship, but were dwarfed by this year’s Sunday Masters tickets, which went for an average of $840.86. To compare these numbers in more depth to this year’s Masters, check out our Masters 2012 post. Get your tickets for all rounds of this year’s US Open (including practice sessions) right here at SeatGeek. Will Tiger move one step closer to Jack Nicklaus’ record of 18 career Major Championship victories or will a young gun such as McIlroy or Ricky Fowler bring home some hardware? That question will be answered this weekend in San Francisco. Image via Flickr user brothm_photos.